The football season is finally here! And with that comes the complex time-management task of watching all the important games with a limited number of TVs in the house. My method: keep tabs on the games via the internet, and if a game starts to look interesting, switch over to it on the TV. 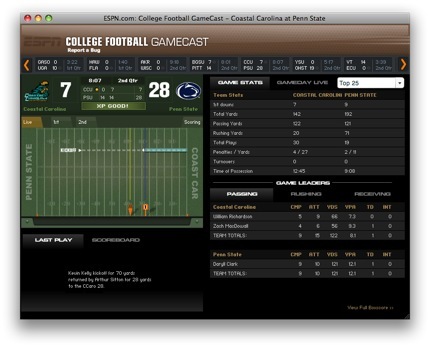 I use this page on ESPN’s website because it lets me see the scores of all the games, real-time. This works for the NFL too, of course. I just prefer watching the college games.